Craig Elliott slammed Boston United’s second half performance as ‘horrendous’. Goals from Kit Elliott and Ben Jackson saw Darlington leave the Jakemans Stadium with a 2-0 win this afternoon. 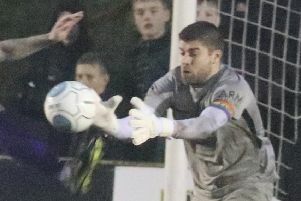 Although the game felt flat throughout, United created goalscoring opportunities in the first half, while keeper George Willis kept his side in the contest with two good saves. But after the Quakers made three changes at the break they took the game to Boston. “I thought we were pretty good first half and then I thought we were horrendous in the second half,” Elliott said. “I said to the players, I’m not sure how you can go from being well on top and playing some good football, maybe just lacking that cutting edge. But second half, same old. “We go a goal down and we might as well finish the game. It’s embarrassing, I’m gutted because we’re saying all the right things this week. “I thought we had a good reaction first half, but after that it was like when we were playing Blyth (last week’s 3-0 defeat).